Jersey’s Atlantic puffin population – a last chance to see? The Atlantic puffin is an iconic bird in the Channel Islands. One of the southernmost populations, those breeding on Jersey and the other Channel Islands belong to the English-Channel or French-Atlantic sub-population. Puffins spend the winter at sea and come ashore to breed in colonies. 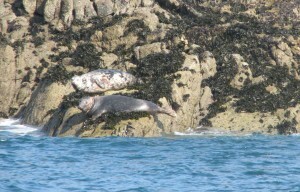 Usually they arrive in the Channel Islands around April and leave again in July. They have a slow reproductive cycle, not breeding until six years of age, and then only laying one egg per year. 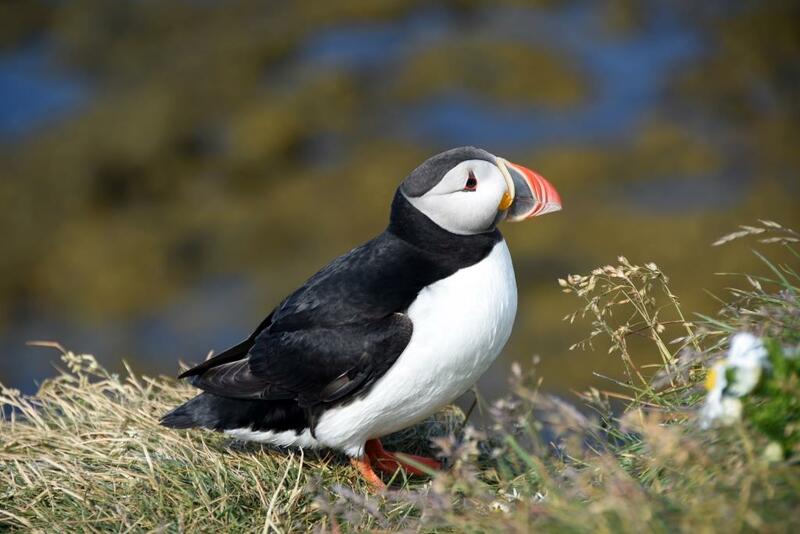 Typically, for breeding, puffins return to the sites where they hatched by themselves and Jersey, therefore, plays an important role for the annual life-cycle of this sub-population. Although there are still good numbers of puffins globally it is listed as Vulnerable with a decreasing population-trend in the IUCN Red List of Threatened Species. No sub-populations are listed separately and it is highly possible that the French-Atlantic sub-population is even more endangered. Annually, about 580,799 pairs breed in the UK, Isle of Man and Channel Islands. Nevertheless, the numbers of the French-Atlantic sub-population are relatively low and have shown a continuous decrease during the 20th Century. Conservation Status of Jersey’s Birds lists the puffin as RED with a severe breeding population decline. 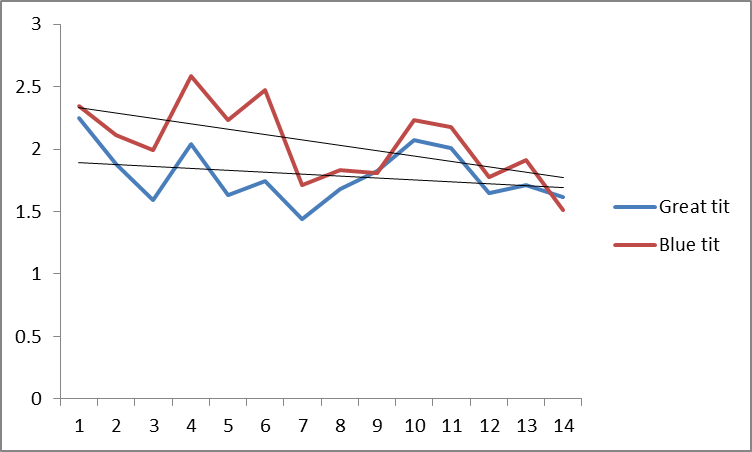 Population-development of Atlantic puffin on Jersey between 1998 and 2015. The reasons for the puffin’s decline on Jersey are not completely understood and may vary with location. 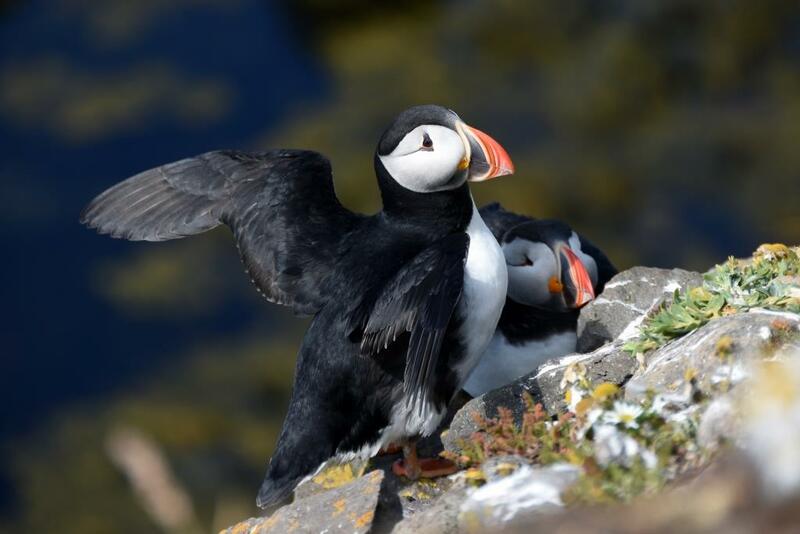 Several causes may play a role: puffins usually nest on offshore-islands free of mammalian predators. Most of the introduced mammalian predators, like the brown rat, black or ship rat, domestic cat or American mink, are good climbers and can also reach the puffins’ nest-holes on steep cliffs. The puffin is, therefore, especially vulnerable to these invasive species. Also native seabirds like herring gull, lesser black-backed gull and great black-backed gull might be a cause of puffin declines through kleptoparasitism or direct predation. Human disturbance through tourism and general boat-traffic at the breeding sites might play a role in decreases. 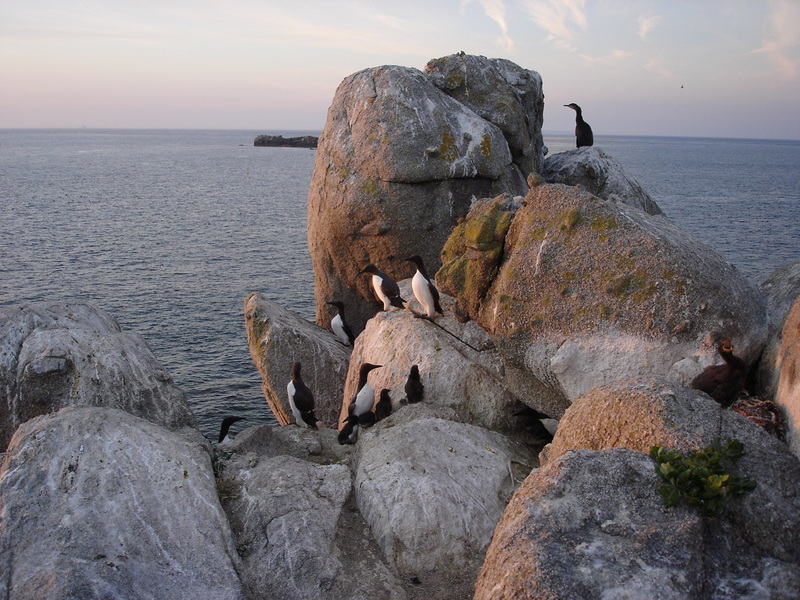 However, there is contradictory evidence: after a tourist-hotspot around the puffins’ nesting sites at Jersey (Plémont Holiday Village) was closed in 2000, a recovery of the population was not seen. This might be an indication that human-presence had little or even no effect on the Jersey-population. Indirect impacts like climate change cause loss of the puffin’s food supply in many colonies. In the English Channel, rising temperatures and other indirect factors like pollution of the sea may play an important role as well. 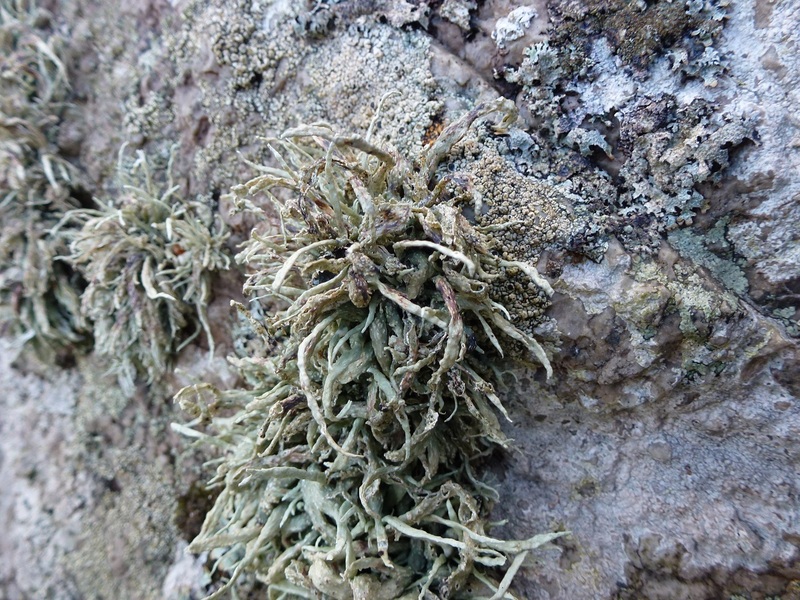 Moreover, one particular fish species, snake pipefish, has increased in number in the region around Jersey and may have been fed to nestlings, as has been recorded in UK, Norway or Iceland for instance (abstract here), although it is inedible for young puffins. Herring, capelin or sandeel should actually form their main diet. There may have been a population of 200-300 pairs on Jersey during 1911-1914, decreasing rapidly from 1915 to only 22 pairs in 1998 and as few as two individuals at the time of writing. My study focussed on recent temporal changes to try to identify of the current status of the Atlantic puffin population on Jersey. Assuming that climate change may play an important role for the puffin’s decline, temperature was correlated to the population size. The methodology used to estimate the number of puffins between 1911- 1915 is undocumented and unlikely to be based on scientific evidence. 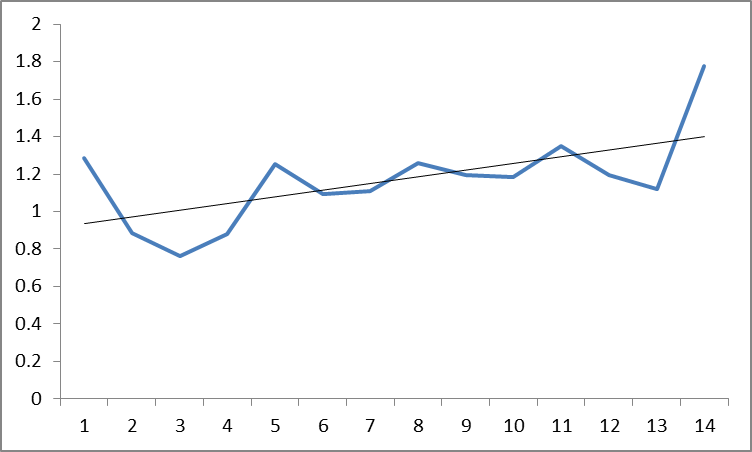 However, the records of the high numbers in 1911-1914 and the drastic decline in 1915 were both collected by the same person (Roderick Dobson). 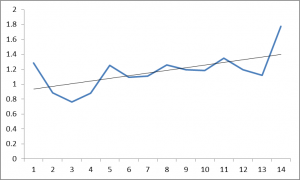 Therefore, although the accuracy of the exact numbers is questionable, it can be assumed that there were high numbers of puffins present at Jersey, which then had a drastic decline. The reason for such a dramatic decline within only four years remains unknown. It is clear though that Jersey has never seen numbers of puffins like that again. Due to a higher human population-density on Jersey, the puffin’s distribution might be restricted by invasive predators and by human presence. Brown rat began occurring on this island in the 18th Century, the black rat was introduced in Roman times. Avoiding pressure from rats, the puffins on Jersey may have become restricted to breed on sites which invasive mammalian predators find harder to access. 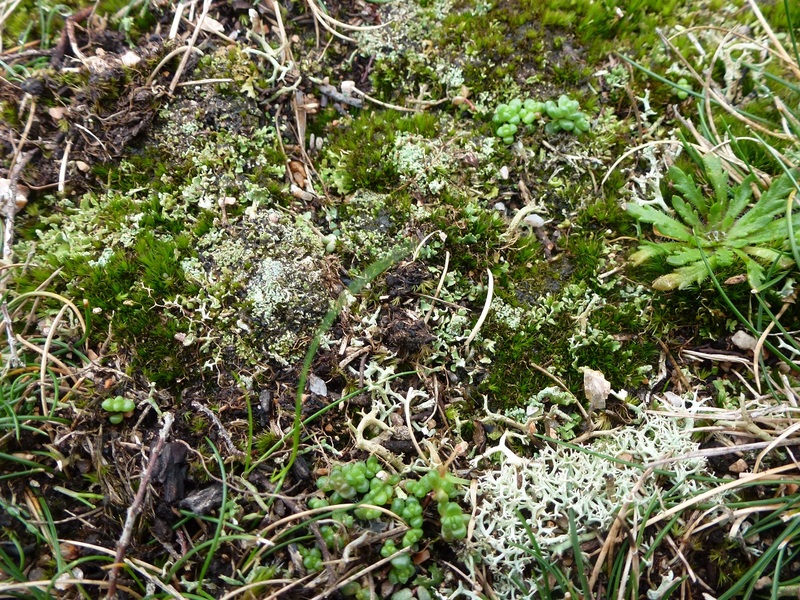 These alternative breeding sites are small and poor-quality, areas like gaps along the cliffs instead of the commonly used burrows on cliff-tops. Although the puffin is considered a flagship species of the Channel Islands, they have not been studied sufficiently and very little is known about their local ecology. 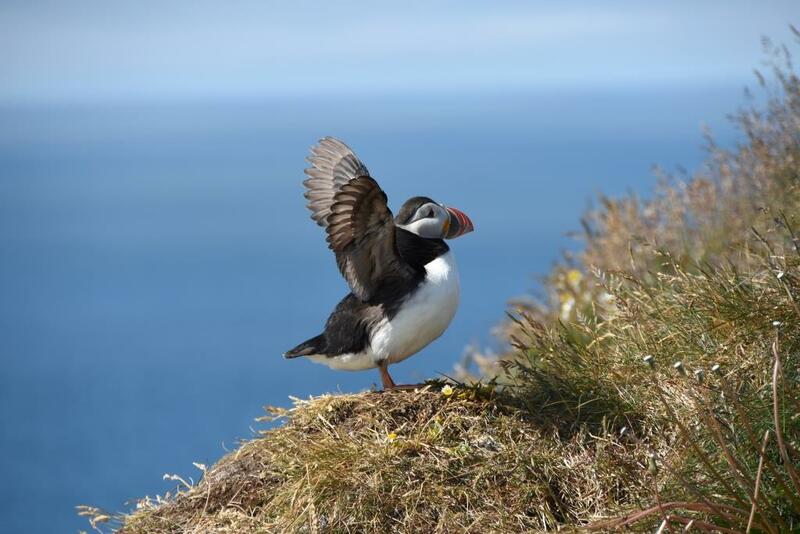 The causes for the puffins’ decline on Jersey are still not fully identified. Although this analysis did not show any correlation to it, climate change as a factor should not be neglected as a potential main reason for the puffins’ decline in the English Channel. While the puffin might have resisted any single factor causing pressure on its population, the combination of all these factors together may be the causation for the eventual decline. 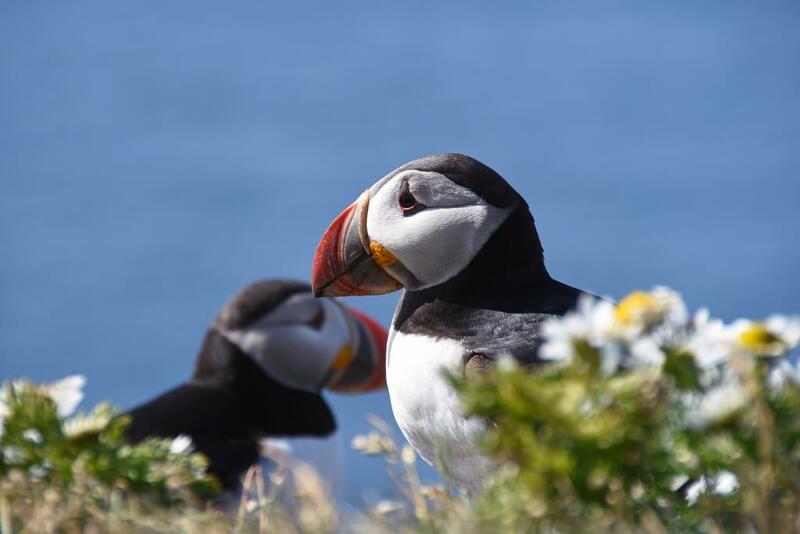 Anthropologically disturbed areas, invasive mammalian predators, rising temperatures, decline in prey availability, and change in available fish species… summing up these factors – they were tough enough to effect the puffin’s population in the end. With few actions taken, or possibly even feasible, to conserve the colony on Jersey, effort should be put into the puffins’ conservation throughout the Channel Islands, to prevent the same fate on the other islands as is happening on Jersey, where the puffin will, sadly, be extinct soon. This assessment was written for the module “Invasive Species and other Drivers of Distribution Change” as part of the Master of Science class “Animal Behaviour: Applications for Conservation” at Anglia Ruskin University, Cambridge. I am grateful to Paul Aked, senior Meteorologist at the Meteorological Section of the Department of the Environment, Jersey for providing me with data on climate. The puffin photos used here were taken in Iceland by Nicolas Guillod. 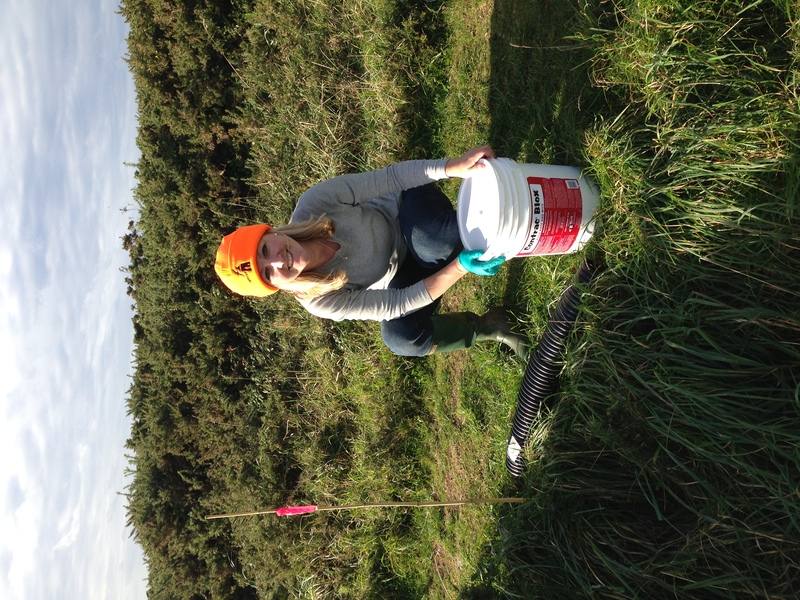 An exciting project is being developed by the Alderney Wildlife Trust, to establish an Alderney Bird Observatory. 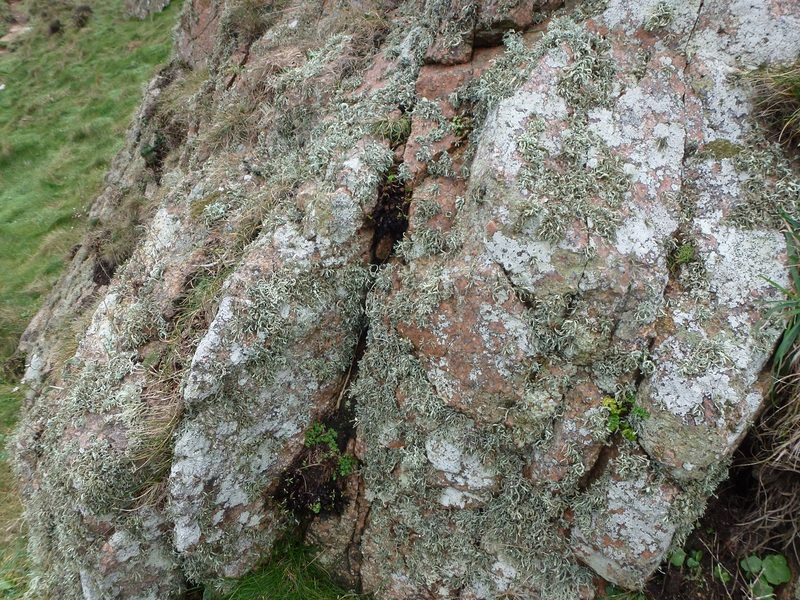 The volunteer warden John Horton has already been appointed and will commence recording across the island and ringing at fixed sites within the Island’s largest Nature Reserve, Longis, which covers much of the eastern end of Alderney and other productive sites like Mannez Quarry. 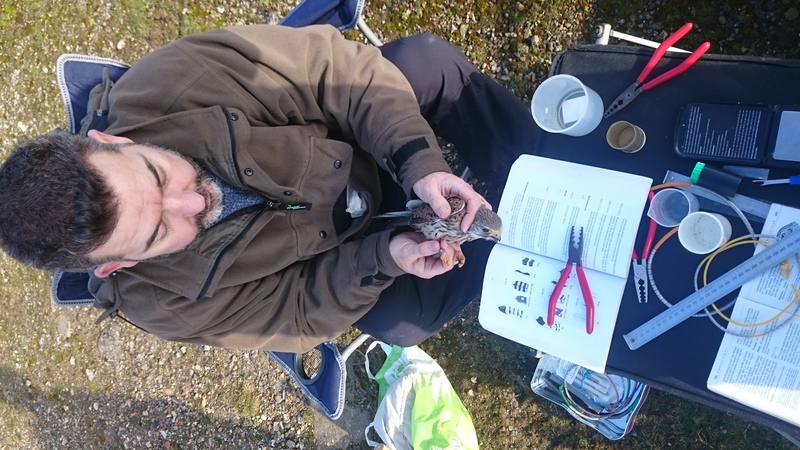 John is taking a sabbatical from his London Metropolitan Police Wildlife Crimes Officer role in order to support this two year project to achieve accredited Bird Observatory status from the Bird Observatories Council, the minimum time allowed for such recognition. John is an experienced ringer (having ringed more than 60,000 birds over the past 10 years), and has full trainer status. 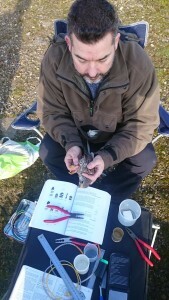 He has a very inclusive approach to ringing, evidenced through his ringing activities in the North Kent Marshes. John has experience of the Channel Islands as he spent a couple of years working at Durrell’s Wildlife Park in Jersey before joining the Metropolitan Police. The Observatory aims to be an educational resource highlighting the value of wildlife to the next generation. John would very much welcome any visiting ringers who wish to support the work through whatever time they can make available. 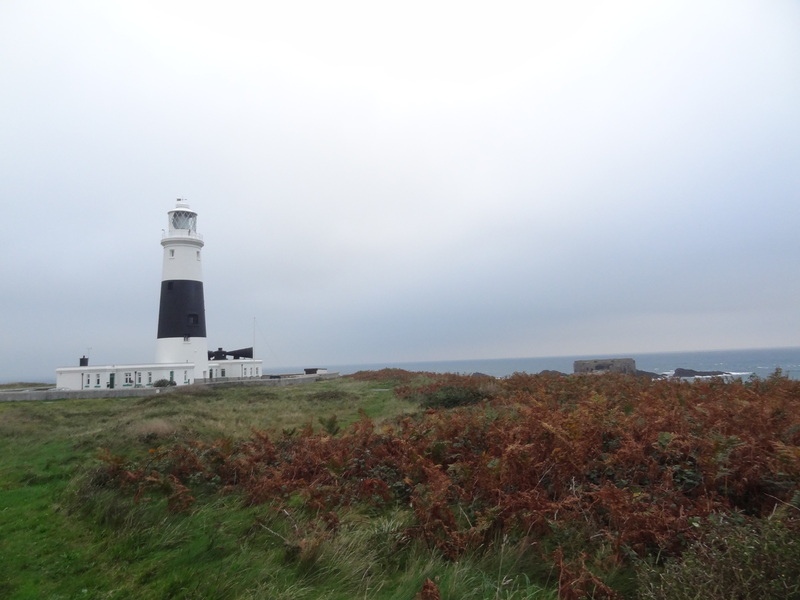 Please note that all ringing activity in Alderney including seabirds should be coordinated through the Alderney Bird Observatory Warden in the first instance. Data collected from the Alderney Bird Observatory will be collated by the Channel Island Bird Ringing Scheme. What is a Bird Observatory? A Bird Observatory is a place which conducts long-term monitoring of bird populations and migration. Individual observatories are located at prime migration points around the British Isles and activity is conducted within a defined recording area. The first observatory was established on the Welsh island of Skokholm in 1933 and since then the British network has become renowned worldwide for its observatories, the quality of their observations and the wildlife viewing opportunities they present. 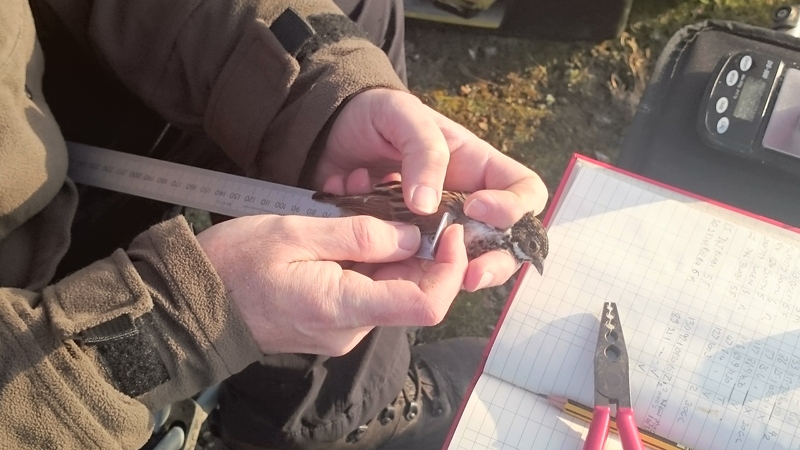 An integral part of an observatory’s work is bird ringing, the capturing of birds by a licensed ‘ringer’, who acts as the observatory’s Warden, thus enabling the study of population dynamics across an international species (British Trust for Ornithology for information on ringing here). 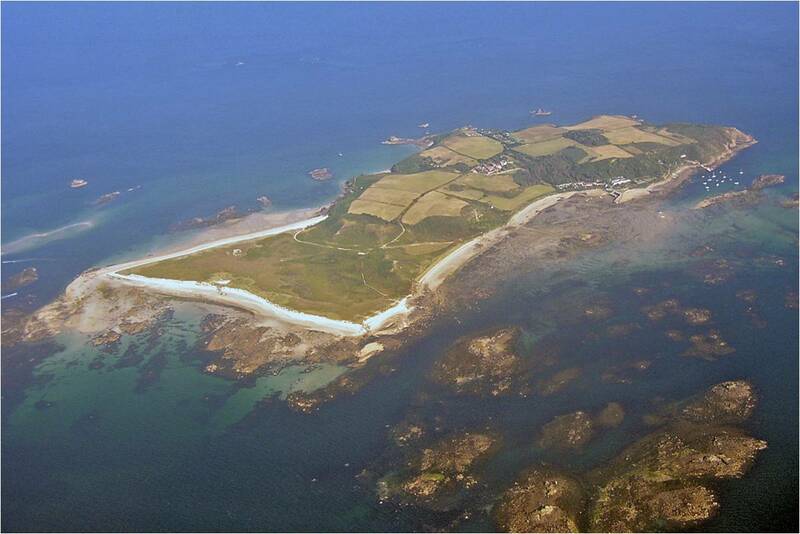 In Alderney’s case the Bird Observatory would work within the Channel Island Ringing Scheme, in parallel to the BTO. Observatories encourage volunteers to participate in scientific studies of birds and the environment, including ringing and more casual observations whilst out enjoying the areas they reside within. The results of these studies are made freely available to researchers and to the public who are welcome to then visit the observatories. 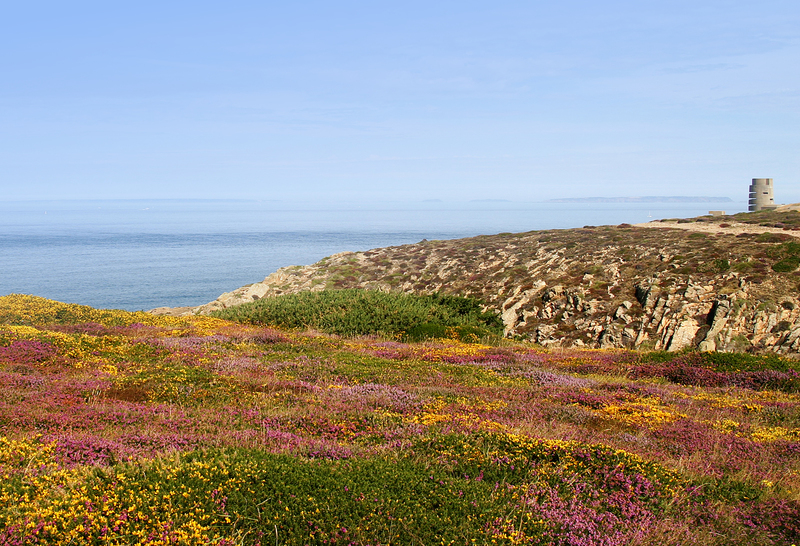 What benefits would a Bird Observatory bring to Alderney? This is a project, born out of the Living Islands initiative, which has already attracted regional media interest and expects to focus the national media on the Island. It will also bring visiting scientists and it is believed a significant number of birdwatching enthusiasts form the UK and Continental Europe, as its reputation develops. It will be the only official Bird Observatory in the Channel Islands and the most southerly Observatory in the British Isles. 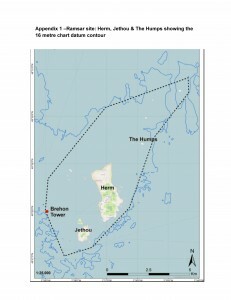 The Trust also envisions the facility will bring an economic boost to the fragile Alderney economy by sustainably exploiting a resource which to a large degree Alderney owns and controls, attracting visitors who would like to participate in the work of the Observatory or who simply want to visit an island which has this resource and reputation. Such visitors will stay in the Island’s existing accommodation (mostly in the shoulder months when migration occurs) and over time there may also be the potential to establish a new ‘hostel’ class of accommodation. This would provide cheaper dormitory or shared room style accommodation for visiting groups, including universities and clubs. 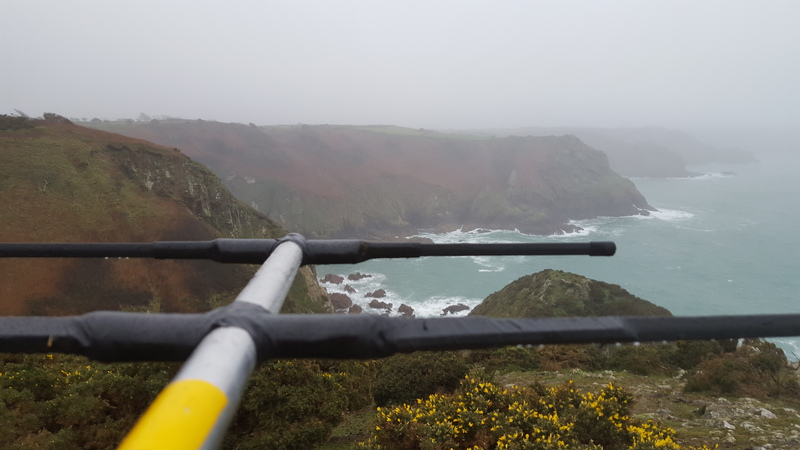 From a wildlife perspective, the Alderney Bird Observatory will provide a mechanism to ensure a high level of continuity and scientific rigor in research, both through observational sightings and through ringing. 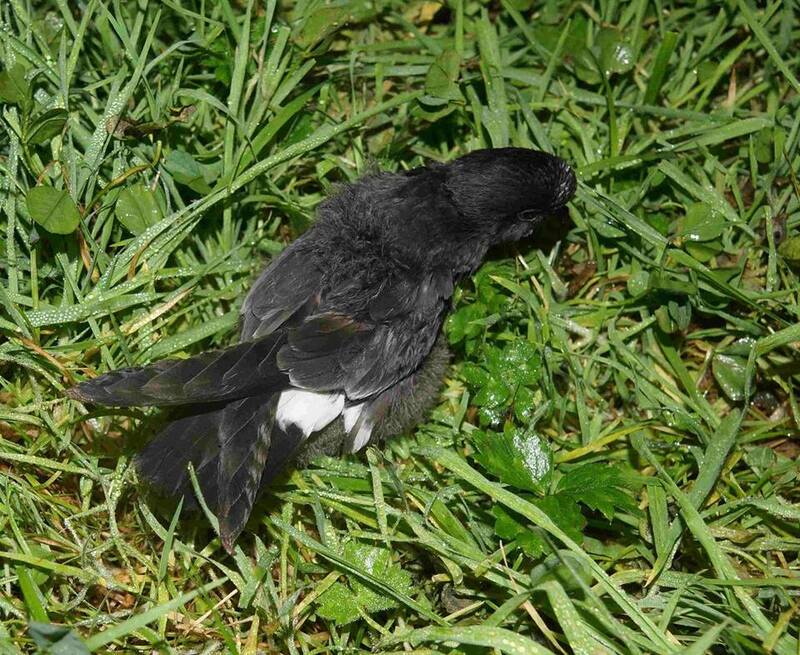 The potential for reporting sightings of rare species of birds will be vastly increased through the coordination of the Alderney Bird Observatory’s full time Warden. 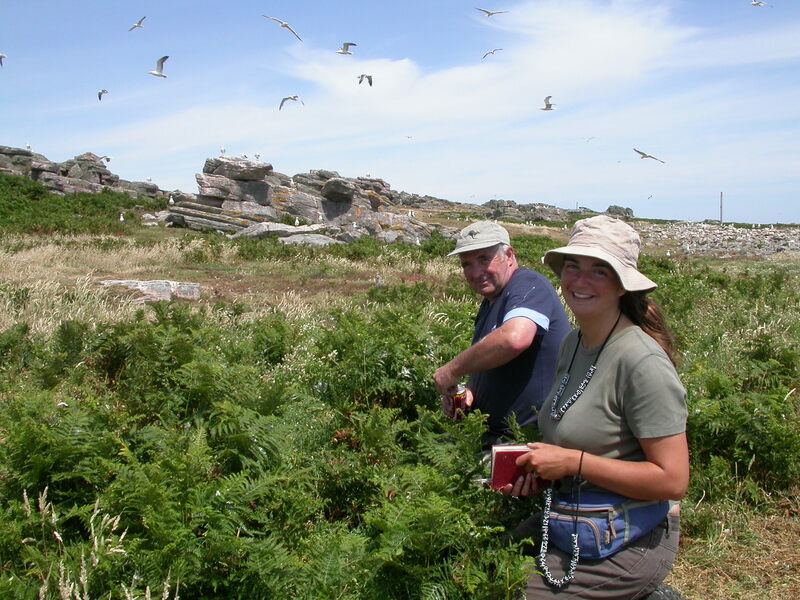 The Trust sees the Alderney Bird Observatory as very much a Channel Islands initiative. Environmental organisations and individuals from Jersey, Guernsey and Sark, as well as the host island of Alderney, will all be participating in developing the Observatory. We reported here on the project to rid two of the Isles of Scilly of invasive rats in order to protect threatened colonies of seabirds and other wildlife. 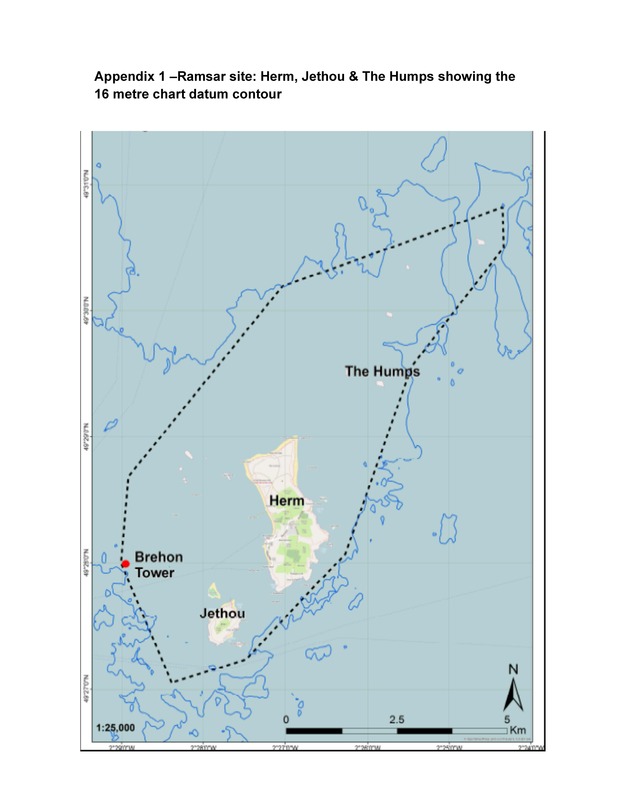 The Scilly Seabird Recovery Project can now report that St Agnes and Gugh are officially rat-free after the last rat was spotted in November 2013. On Saturday 13th February St Agnes and Gugh in the Isles of Scilly were declared officially rat-free after passing a thorough month-long inspection two years after the last signs of rat activity were spotted. This is the world’s largest community-led rat removal project. 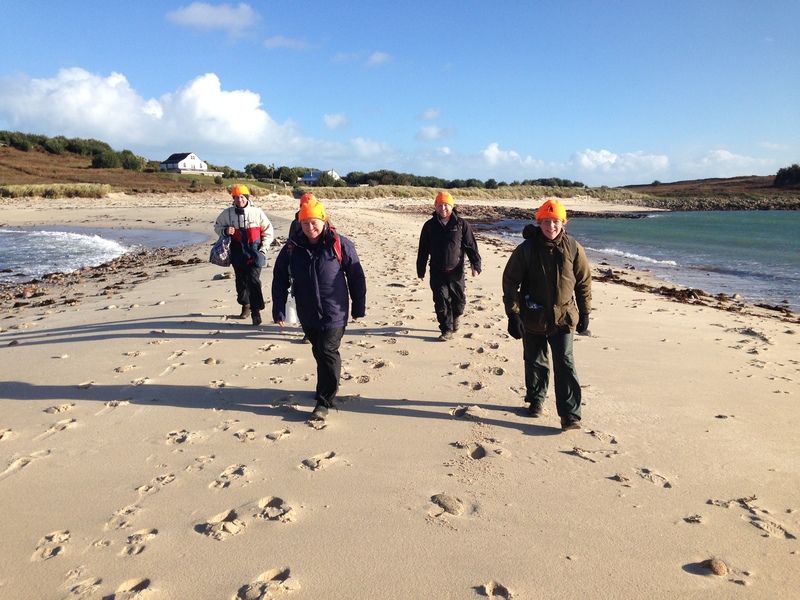 Local volunteers worked with conservationists from the Isles of Scilly Seabird Recovery Project and island restoration specialists Wildlife Management International Ltd (WMIL) to rid their islands of the rats that were killing seabirds. The project has been a huge success and benefitted from essential support from EU LIFE and the Heritage Lottery Fund as well as local organisations. Brown rats arrived on the islands in the 18th century following several shipwrecks. 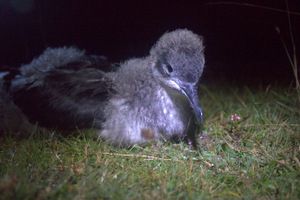 The population of rats grew and became harmful to the burrow-nesting seabirds that lived on the islands, including European storm petrels and Manx shearwaters. 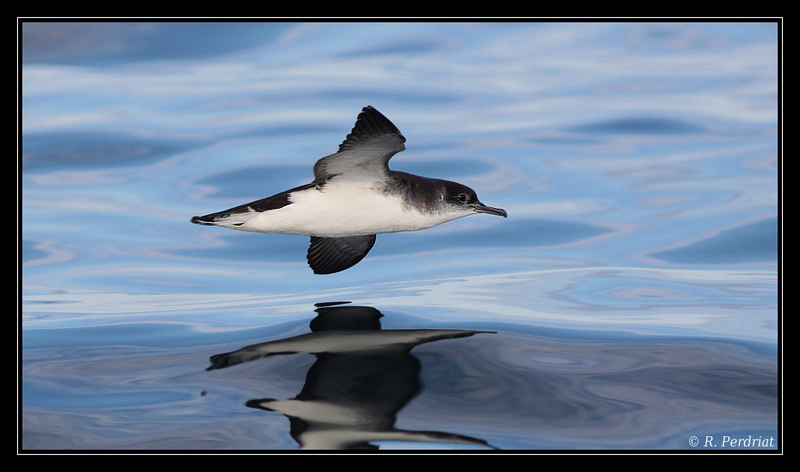 With numbers of these species declining since the 1980s the removal of the rats was essential to the protection of the seabirds. Work began in 2013 with an intensive six-month operation to monitor rat activity on the islands. 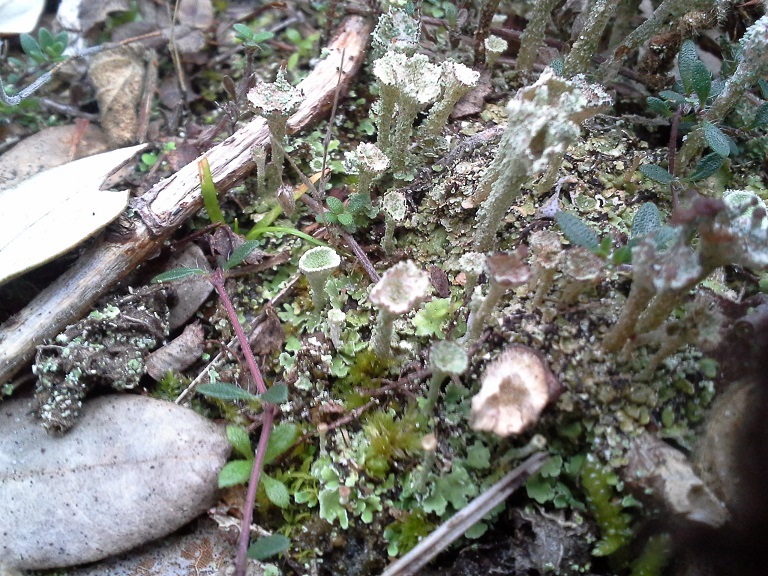 WMIL worked with over 30 local volunteers to find rat nests and signs of activity. This information was used to create a strategy for eradicating the rat population, with an intensive programme of baiting and poisoning for a month in the winter. 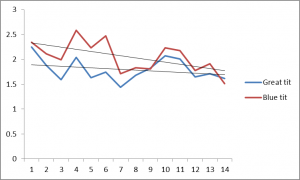 Baiting started on 8th November 2013 and continued every day, as the days passed the amount of bait taken was monitored. And by the end of the month the last evidence of rats was observed. Treatment and community projects continued, but no further rat activity was detected. The specialists returned at the beginning of the year to check for any signs that rats might still be present on the islands. Having completed this follow-up survey St Agnes and Gugh now meet the international criteria to be declared rat-free. 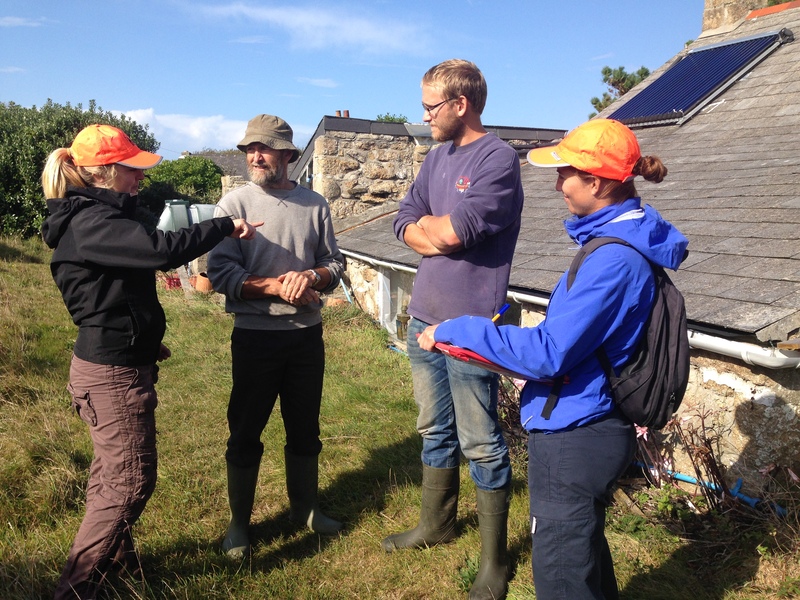 This project is a partnership project between RSPB, Isles of Scilly Wildlife Trust, Isles of Scilly Area of Outstanding Natural Beauty, Natural England and Duchy of Cornwall. Birds On The Edge is grateful to Gareth Brede for help with this article. 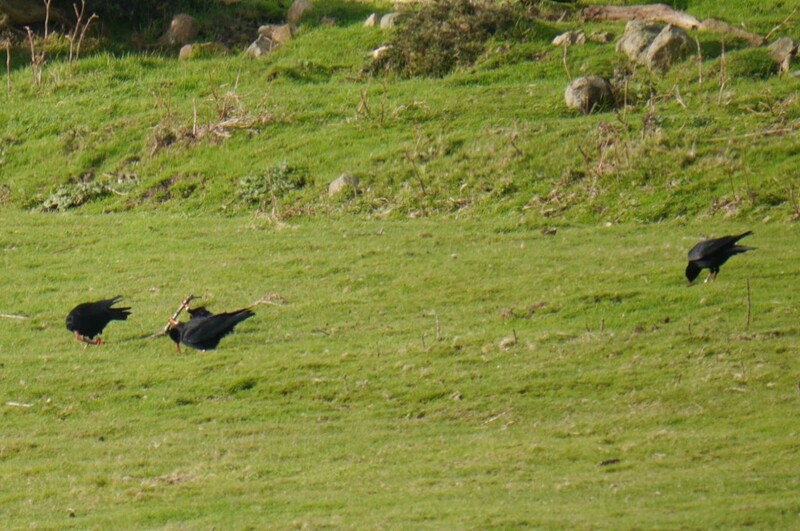 The choughs (and a couple of crows) searching for food in the National Trust conservation field near the aviary. Photo by Liz Corry. It was a very cold, wet and windy start to the new year bringing with it several challenges for the choughs at Sorel. Their primary concern, as always, was to find food to keep them fueled throughout the bitter and blustery days. With the grazed land saturated by rain water, insects were hard to come by. This might explain why they started making regular visits to the conservation fields. An untapped source of insects? The cliff face around Devil’s Hole, where the water runs off rather than collects, also proved popular exemplified by their muddy bills and heads. Finding the choughs in the rain. Photo by Liz Corry. Fortunately there was only one day of ground frost which disappeared fairly quickly. 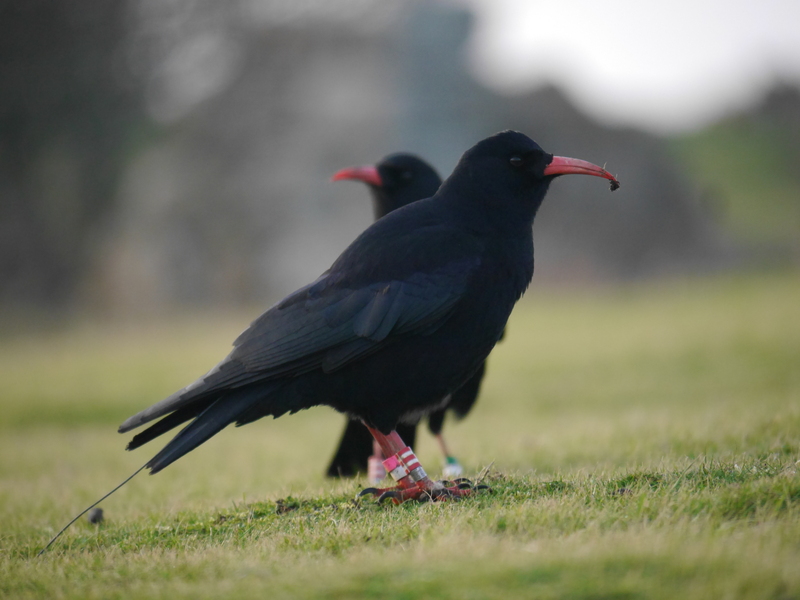 Chough bills are efficient digging tools, but they are not tough enough to break hard ground. 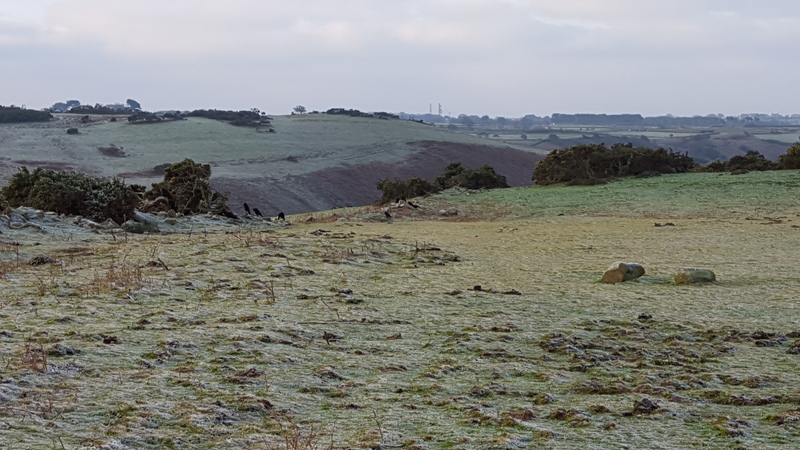 An unseasonal or prolonged period of ground frost can lead to starvation and is often detrimental to wild chough populations. Ground frost at the start of January. Photo by Liz Corry. 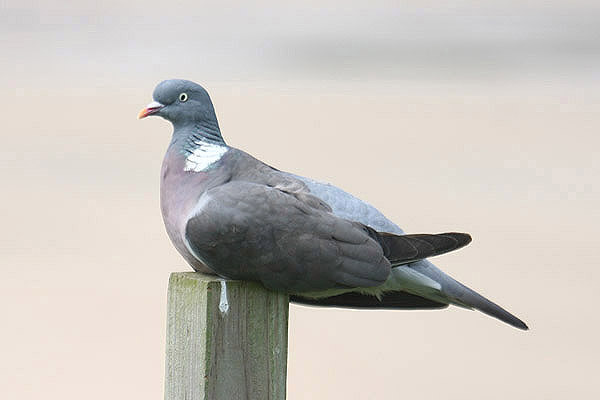 Jersey experiences another kind of ‘ground frost’ for birds at this time of year. Jersey Royals are planted in January and the farmers cover their crops with protective plastic sheeting. 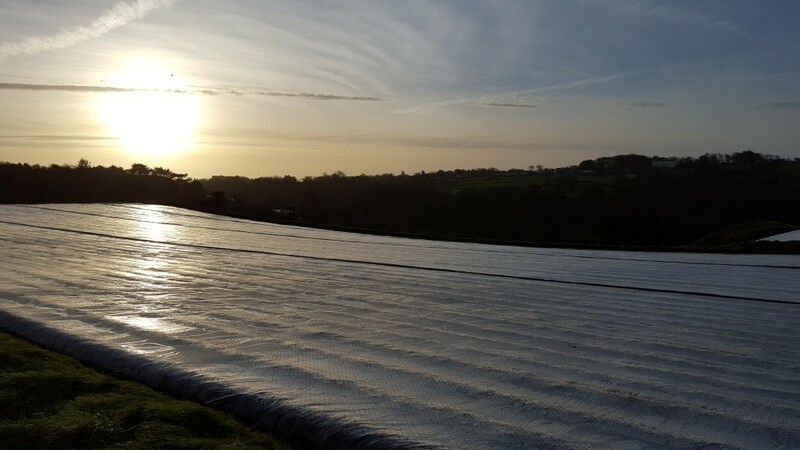 The sheeting is largely to protect from ground frost and encourage growth, but also stops birds stealing or damaging potatoes. Of course the choughs are not interested in vegetables they want the insects in the soil. 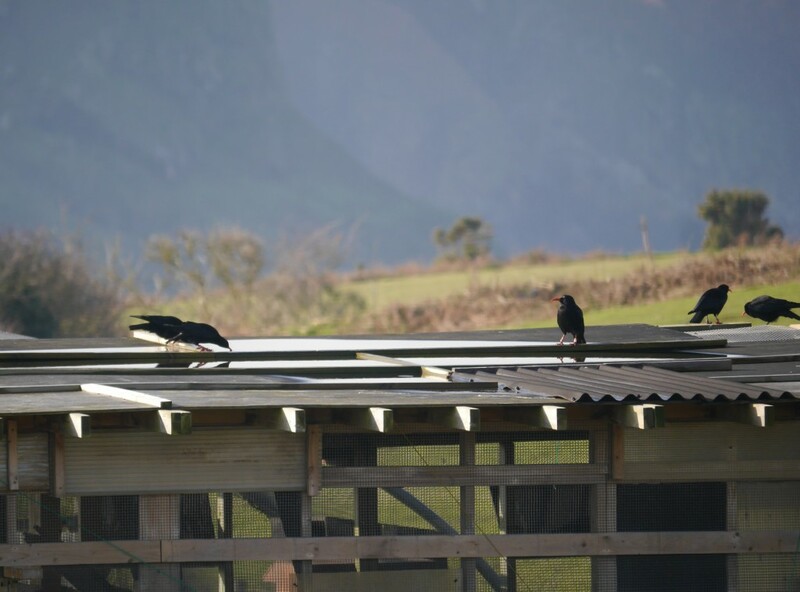 When the young choughs flew over to Crabbé this month after a short spell away you can only imagine what was going through their minds the first time they flew over the fields. Potato fields in Jersey are now covered to protect the freshly planted Jersey Royals. Photo by Liz Corry. 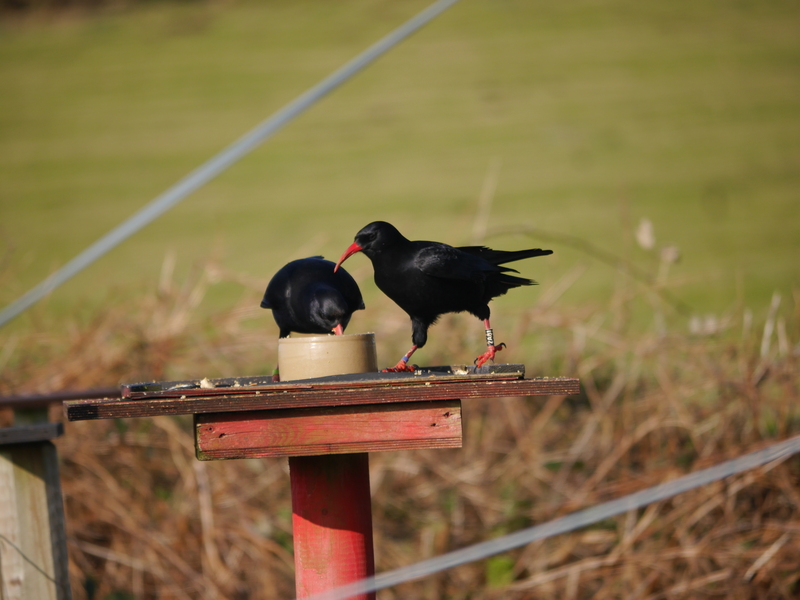 Jersey’s chough population became a bit more reliant on the supplemental feeds at the aviary. This is where there next challenge awaited. How to fly through release hatches into the aviary with 40+ mph tailwinds or cross winds without smacking into the frame-work? Those that did risk actual life and limb demonstrated just how aeronautically skilled this species is. For the likes of Ormer and other less confident individuals, the team started placing food bowls on the ground outside of the aviary. For those inside who then found themselves struggling to stay grounded on the tables, the bowls were placed in more sheltered positions. Helier was blown backwards off the aviary shelf. Fortunately no damage except to her dignity. Photo by Liz Corry. 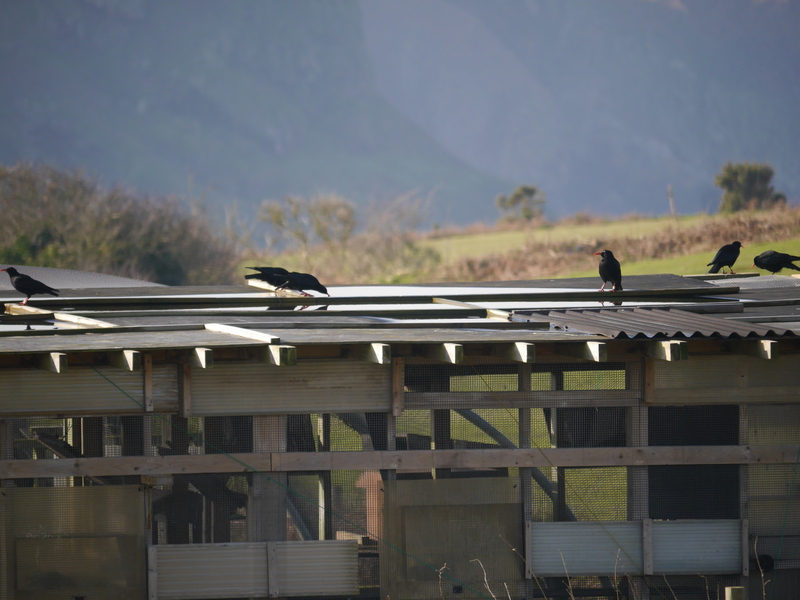 The choughs demonstrating their association with the target board and food. Photo by Liz Corry. There have been a few times this month when the weather has been so bad, the group fail to turn up for the aviary feed. Opting instead to stay sheltered on the cliffs by Devil’s Hole or in the dry, warm quarry buildings. Who can blame them? There is growing concern for the aviary itself after three winters out on the cliffs (four if you include whilst it was being built). One of the shelter stands became dislodged from the framework after overnight gales. The integrity of the plywood roof is beginning to give, reducing the amount of dry shelter spots for the birds when they roost and keeping food bowls dry. Ideally a new bitumen-panel roof needs to be fitted with guttering to collect rainwater (5-10 litres of water is carried to the site each day). This cannot be done without finding funding first. We estimate costs to be around £500 or less if we can find reclaimed materials. Then, all we need is a day when the winds won’t blow the builder off the roof! A bonus function of the present aviary roof? – fresh drinking water. Photo by Liz Corry. 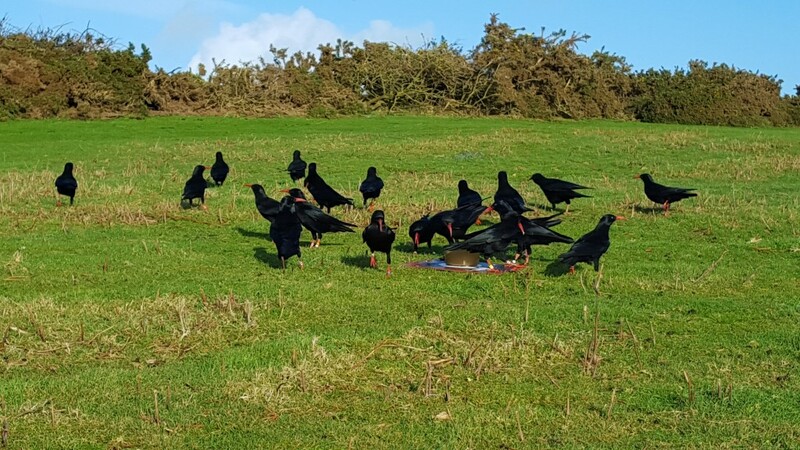 That being said, January did experience a few sun-blessed days much to the excitement of the choughs who took full advantage of the calmer weather. Visitors to Sorel will have seen amazing aerial displays from the group. Some of the younger males have started displaying around the breeding females involving lots of tail flicking and running around like a scene from a Benny Hill sketch. 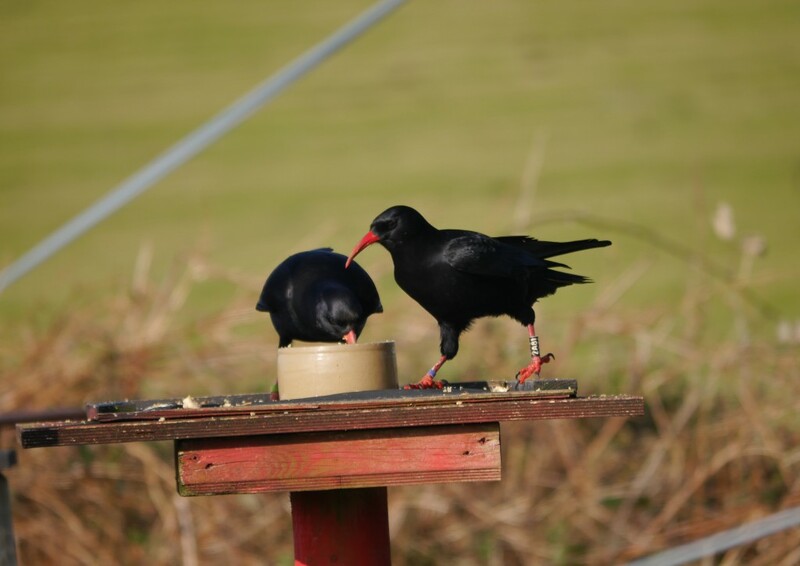 January is the month when the choughs start planning for the upcoming breeding season. Nest prospecting (weather permitting) and looking for potential partners. We switched their supplemental food to the breeding diet which means more protein and calcium. The captive pairs at the Wildlife Park will switch to their breeding diet when they move from the flocking aviary into their separate breeding aviaries. 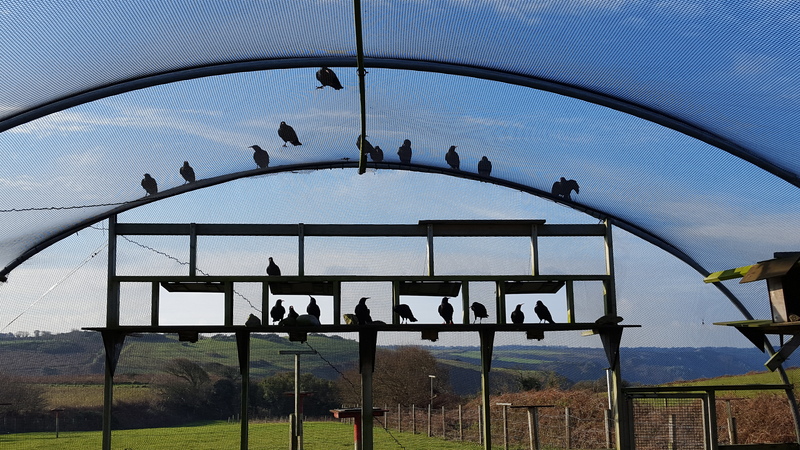 Twenty-two choughs waiting for staff to put out their supplemental feed. Photo by Liz Corry. We have tried to see if the choughs would take a pelleted diet. The expected cost of supplemental feeding for 2016 is approximately £3,000. An all-in-one pelleted diet could reduce this as long as it is not at the expense of the birds’ nutritional needs. So far we haven’t found one which the birds will not either ignore, flick out of the dish, or jump from in fear. Yes that actually happened! Just for fun here are two of the youngsters searching for insects in a slightly unusual way…..
January was looking set to be a relatively mundane month to report back on. 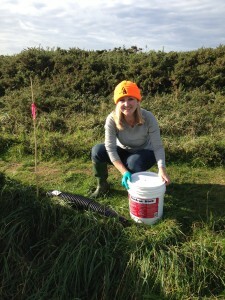 That was until the morning of the 31st when Durrell student, Nicci, was out on radio-tracking duties. 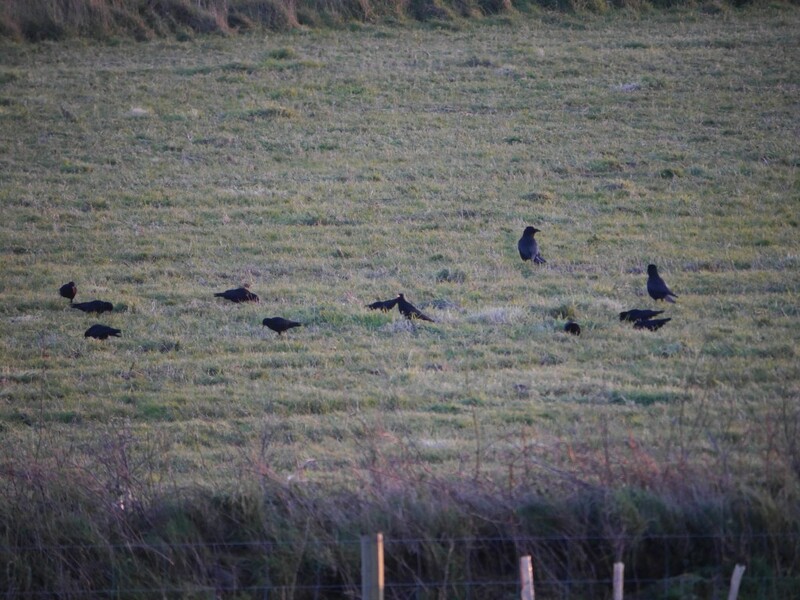 The choughs were spread out as per foraging around Sorel and Mourier Valley. There are seven birds whose daily movements are being tracked with proximities of the other fifteen birds in relation to those focal birds also logged. Not all twenty-two need to be accounted for at each session, but they usually are as the group stick together out of the breeding season. ‘Brunch’ at the aviary is when we expect to see all of the birds at this time of year. On this occasion there were only twenty-one. Nicci’s concern started to grow over the course of the afternoon as there was still one bird unaccounted for. At the afternoon feed she could still only count twenty-one. Mentally ticking off leg rings from the list time and time again Nicci reported back to the team that Dusty’s mum, Blue, was missing. Blue, pictured here with her partner at the aviary in January. Photo by Liz Corry. She was last seen the day before, an hour before roost. Her and her partner now roost in the aviary, as opposed to the quarry, where the only threat at night would be from a feral ferret or cat. In which case you would expect signs of intrusion at the aviary and the group to be behaving differently the following morning. Nothing. Was she off exploring for nest sites without her partner? Had a peregrine snatched her? Would she reappear the next morning? Only time, and February’s report, will tell. The Inter-Island Environment Meeting (IIEM) 2016 Organising Team cordially invite you to the 2016 Inter-Island Environment Meeting. 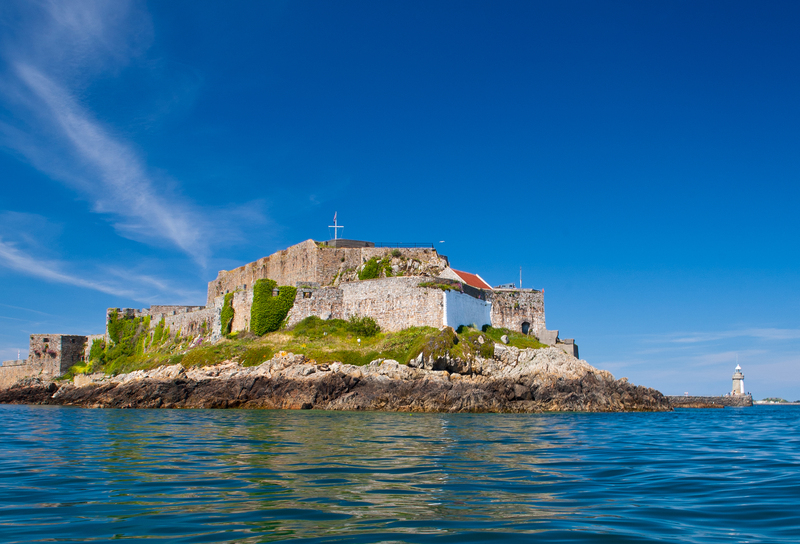 This year’s IIEM is being held at Castle Cornet, Guernsey on 22nd – 23rd September. The Meeting is being organised by La Société Guernesiaise in partnership with the States of Guernsey, with sponsorship from Insurance Corporation. 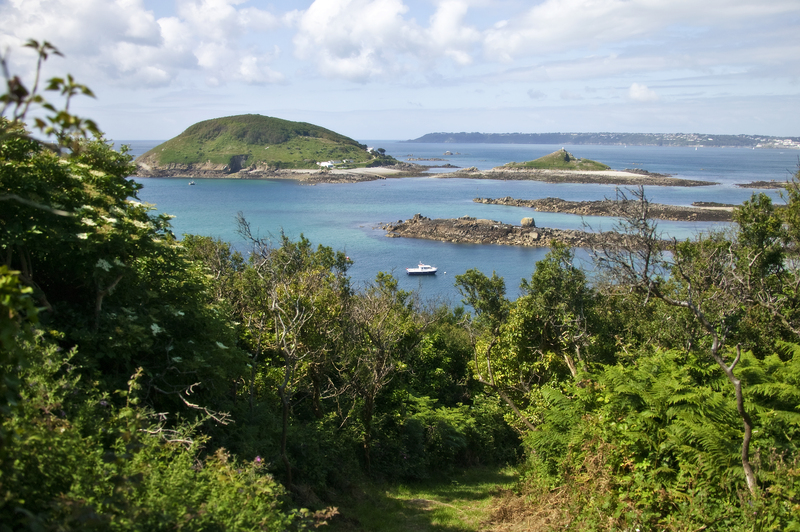 This year we plan to incorporate a field trip within the programme itself, over to Herm, to look at the newly designated Ramsar site. The theme of the this year’s Inter-Island will focus on Designations which recognise the importance of a particular area, species, habitat, or policy and how we can make them work in the most effective way in the context of island jurisdictions. Further details about Guernsey IIEM 2016, including the programme and booking arrangements, will be circulated in due course and available through Birds On The Edge. In the meantime we wanted to, firstly, flag the meeting as early as possible for your diaries and secondly, to gauge the level of interest at this stage and garner people’s views about what they’d like to see and hear at this year’s meeting. We are also looking for contributors and if you would like to present a paper or provide a poster for the event we would love to hear from you as soon as possible. Attendees of previous meetings will have received notification from the organising committee. If the Inter-Island is new to you or you missed recent meetings please email BOTE at birdsote@gmail.com to join in. You can see details of previous meetings here 2015, 2014 and 2013. 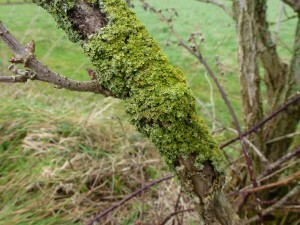 What better way is there to spend Valentine Day than planting a hedge; well the wildlife will certainly love you for it! Jersey Trees for Life is continuing with its Jersey Hedgerow Campaign project which plants trees and hedging to make up for losses caused by a number of reasons including Dutch Elm Disease, storms and certain modern farming practices. 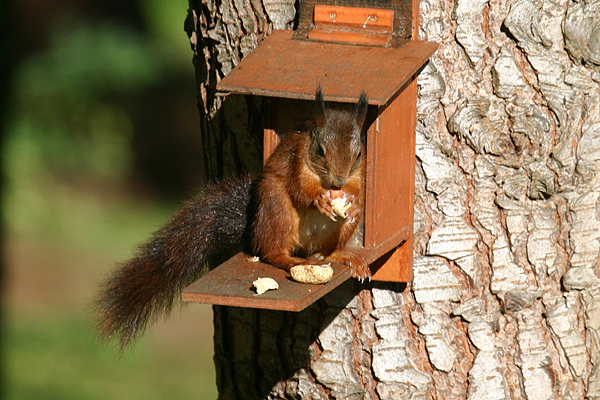 Having started in 2008, this is the 8th consecutive year of mentoring the three chosen flagship mammal species of red squirrels, hedgehogs and bats. The latter are being focused on this year where it is planned to plant over 2,500 tree and hedging whips over the course of this winter. Since its inception some 24,000 whips have been planted which equates to over 18 km of new or restored hedgerow being planted. The details The field boundaries to be planted will have been previously marked out with hedging at 0.75 metre centres and trees positioned at 5 to 8 metres. After a detailed demonstration, volunteers will be initially digging the holes and then planting the whips, followed by fitting the materials such as tree shelters, spiral guards and mulch mats. It is important that attention is paid to detail so the hedging whips are planted upright, in a straight line, roots are fully covered and the plants are firmed in well. 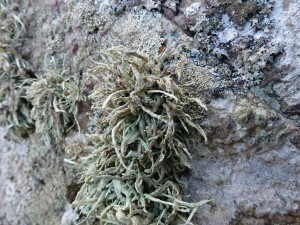 Volunteers will be encouraged to work steadily and make sure the task is completed to a high standard so the plants have the best chance to establish in this harsh environment. Parking Parking will be in a field nearby…just look for our silver pick-up! Tools needed If you have a garden spade please bring it with you and gloves if you have them. Clothing needed Appropriate clothing including sturdy footwear and long trousers is recommended due to the terrain and vegetation in some areas. Be prepared for any weather conditions as we will go ahead regardless! Waterproofs, thermals or sun screen (fingers crossed) may all be useful. Finally, and some would say most importantly, Kim the Kake will supply us with hot drinks and her yummy homemade cakes. 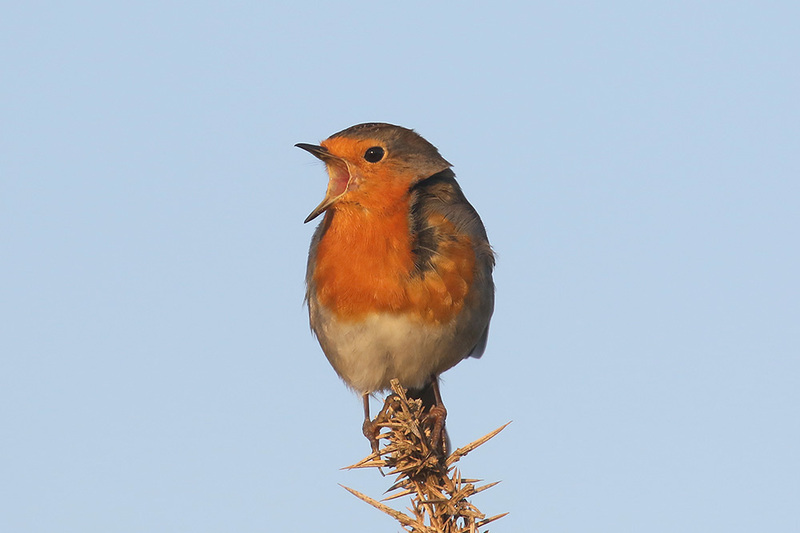 Proving that a year can come and go very fast, in partnership with Action For Wildlife and the Jersey Evening Post we are once again asking everyone in Jersey to spend a few minutes this weekend to count the birds in their garden. 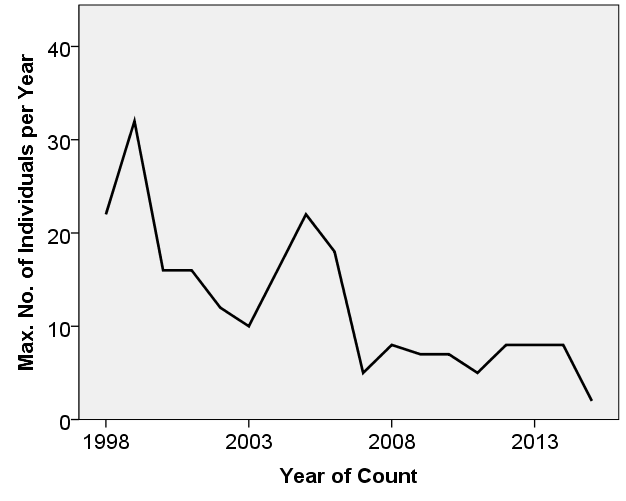 Analysis of sightings from the previous 14 years makes it very obvious that not all our favourite garden birds are faring so well and populations are changing dramatically. But, how exactly do we know. Well, we count them. In fact, lots and lots of people count them. And not just birdwatchers but everyone who likes birds because, let’s face it, everyone likes birds. And they are often easy to count because they can be pretty obvious especially as they come into our gardens. And it’s in the garden, that Islanders can once again help us understand better what is happening with our birds. Data shown by the survey are very important in highlighting what is happening in our wider environment and, while not covering the whole countryside, results do bring home to everyone wider concerns. Just think, if the birds are doing badly in our gardens where we feed and protect them, what is happening out there in the rest of the world. So, please, over this weekend follow the guidelines printed below or in this coming Friday’s JEP and tell us what birds you see. We can add up all the counts (we have 14 years’ worth already) and easily pick up changes that are happening right in front of us. Will there be even fewer greenfinches than last year and will wood pigeons have finally taken over our bird tables? Or will squirrels eat all the food! We call this ‘citizen science’ so consider yourself all citizen scientists! And don’t forget. For this survey, squirrels can consider themselves birds so please count them too if you see any. Counters should note the highest number of each species of bird that are seen together at one time during that period – not the total number which enter your garden over the period of the watch. Survey forms and a handy identification guide will be published in the JEP on Friday the 5th and all data received will be passed on to La Société Jersiaise to add to their records and included in Birds On The Edge bird monitoring analyses. 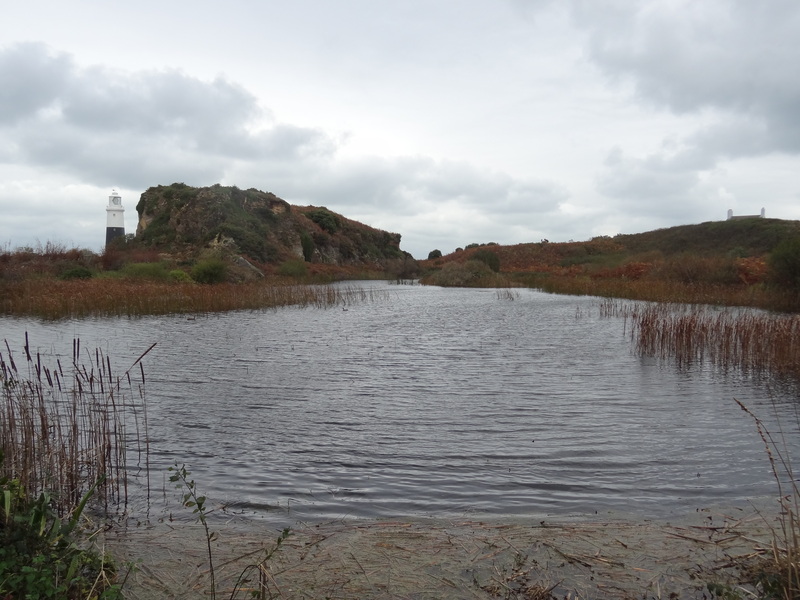 Guernsey’s Environment Department is pleased to announce that Herm, Jethou and The Humps have been formally designated as a Ramsar site under The Convention on Wetlands. The announcement coincides with the run up to World Wetlands Day (2nd February) which is marked each year to promote the importance of wetlands not only for wildlife but for local economies as well. 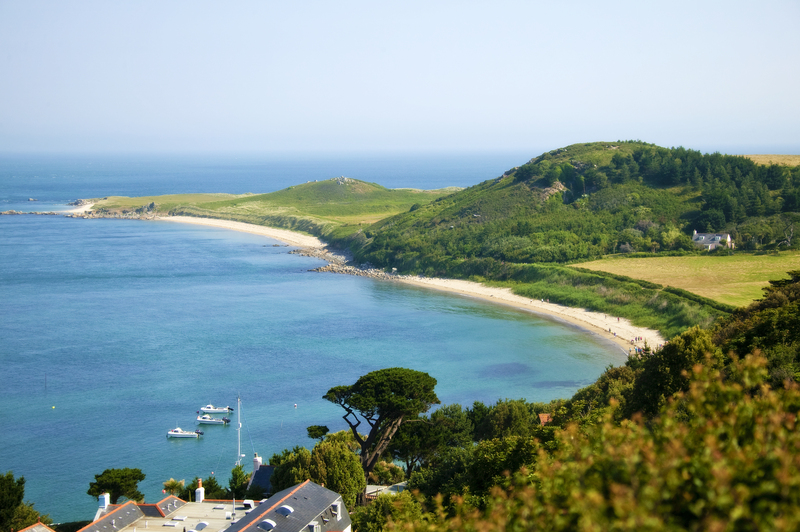 Minister for the Environment Department, Deputy Yvonne Burford said “Herm has always been a favourite place for residents and visitors alike and I am delighted that the island’s treasure trove of wildlife and flora has been recognised at an international level”. Anthony Ford Parker, owner of Outdoor Guernsey said: “It is great to see this wonderful place recognised. One of the best ways to help preserve a special place is to understand more about it and show others how important it is. We are looking forward to having a role to play in educating visitors to the area and helping promote Herm as special place in the world. A set of stamps to mark the designation has been commissioned by Guernsey Post using artwork being prepared by artist Wendy Bramall and which reflects the wildlife, history and use of the site. The stamps are due for issue later this year on 27th July and the issue will complete the set of Ramsar stamps which have already been done for Guernsey, Alderney and Sark. It is hoped to hold a reception in Herm in July to officially celebrate designation. The help and support of Defra, Joint Nature Conservation Committee and the RSPB (in particular their Project Manager, Paul Fisher), in achieving designation is gratefully acknowledged. Designating a site as a “Ramsar site” gives international recognition of the special environmental, cultural and heritage characteristics of a particular area. In particular designation lays the foundation to develop a management plan, in full consultation with those who manage, live and use the area, to ensure the conservation of key species & habitats. Ramsar designation has as its core principles the wise and sustainable use of the resources of a given site through the development and implementation of the management plan. 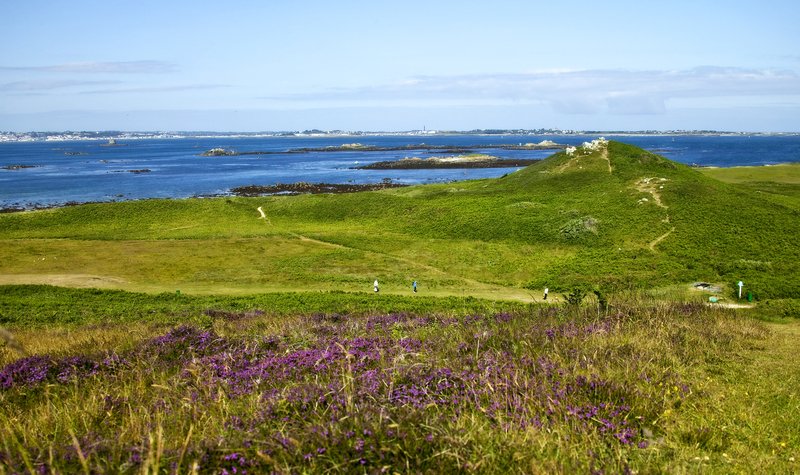 The recognition and management of ecologically important areas such as Herm is consistent with the aims and aspirations of Guernsey’s Biodiversity Strategy which was recently adopted by the States of Guernsey at its December meeting. 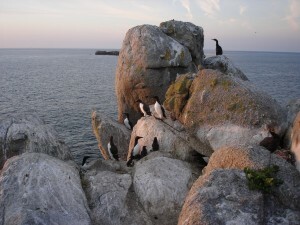 The various marine and land habitats on and around Herm support a rich diversity of flora and fauna including important breeding areas for sea bird species such as lesser black-backed gull, puffin and shag. 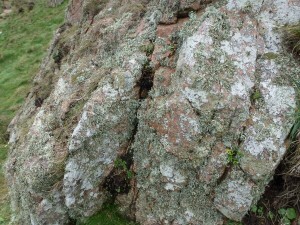 In addition, Herm Common has an excellent cultural heritage, with numerous archaeological remains. Whilst Ramsar status does not confer any legislative protection, recognition of an area contributes to the long-term conservation and wise use of an area. This recognition can provide a positive focal point for new education, tourism and environmental initiatives. Evidence of this is provided by Alderney which has promoted their Ramsar site heavily using ideas such as “Puffincam” and “Gannetcam” (see cameras site here) and has led to the development of the Living Islands initiative.